Arguably even more useful than summoning pizza, Amazon's line of Echo smart speakers may one day tell different users apart just by hearing their voices. 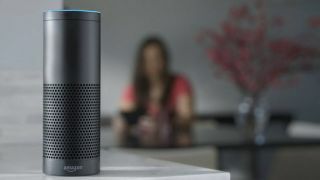 Amazon is reportedly working on a feature for the Echo's digital assistant, Alexa, that allows it to distinguish between users based on their vocal print, anonymous sources familiar with the matter tell Time. Alexa-enabled devices like the Echo and scaled-down Echo Dot can currently swap between users via the Alexa app or saying "switch accounts" to the device, but this feature would allow Alexa to know who's who without needing to manually set a new active user. Recognizing a user's "Voice ID" - the name engineers at Amazon allegedly call the in-development feature - comes with benefits besides just convenience. For starters, vocal recognition could be used for verifying purchases made through an Echo, ensuring that only those authorized to use the credit card paired with the smart speaker are the ones calling in orders. Additionally, knowing who's speaking could further improve Alexa's ability to make individual recommendations for media, products, news, or other miscellanea tied to a single user's tastes. One example where this could come in handy is with music streaming services like Amazon Prime Music or Spotify, wherein Alexa can play music you'd like in a snap rather than, say, accidentally resume that One Direction playlist your younger sibling was listening to earlier. Though it seems like the logical next step for Amazon's audio-based assistant, the retail/tech giant has yet to officially confirm it is working on Voice ID. That said, as competing assistants like Apple's Siri and Google Assistant heat up the competition, we wouldn't be surprised if the feature makes an appearance in the coming months as a way for Amazon to set Alexa apart from the pack.